Here is the actual conductor from that light rail ride. The conductor was at the podium. The notes on the pages before her were waiting patiently to come to life for all the world not to hear, but to see. I have never seen anything quite like it. 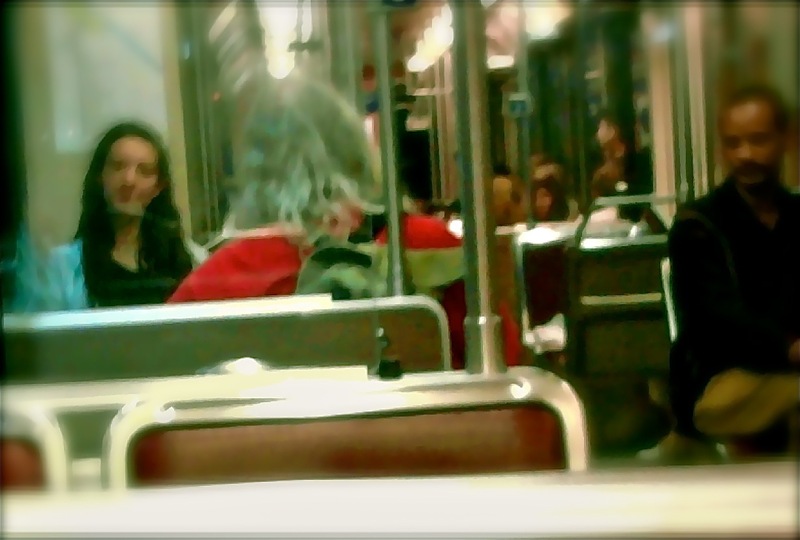 The young lady sat in her seat on the light rail one day seemingly in a world all to herself. But was she? Sitting there with a thick and scattered looking book of music scores on the seat next to her, her posture appeared to sit up as to signal the musicians inside her mind that the time has come for this concert to begin. Without a sign of care or distraction at the passengers within this train staring upon her with both intrigue and mockery, she began the most powerful concerto that was never heard. Effortlessly moving her hands to the music jumping off the pages before her, she was not just conducting the orchestra within her mind, she was conducting the orchestra within all of our minds who sat and watched. As the train came upon its next stop, passengers both came and went. Unknowingly to the longer haired older gentleman who just climbed aboard, he took his seat directly in front of her… facing her. What would she do? Would she get embarrassed? Would she stop? I imagined along with many others on this train, no doubt, what might just happen next. As the doors closed and the train began to move, the conductor once again arose in her seat to signal the orchestra that the brief intermission was over. And with this, she once again began conducting a most powerful of overature. I only saw the back of his head as he sat virtually 2-3 feet directly in front of her. Yet in this, I can only imagine what went through his mind as she appeared to gently sway her imaginary baton in her right hand while inviting the brass section to begin playing with gentle crescendos with the other. With light posts outside the train windows quickly moving past every few seconds from within the tunnel we were passing through, the rhythm in which she was conducting seemed not only to seamlessly drive the orchestra inside her mind, but that which was outside of her mind as well. With every down beat of her conducting hand seemed to pass a bright light just out the window. Even my thoughts began to sway with each movement of her baton. I wonder if anyone else noticed this? To her, it was all music. In this, if we simply let this experience simply be just that… a young lady on a train conducting to music in her head, we would be losing out on something. For I believe there is a song inside each of us waiting to be brought to life. And the best of songs are the ones we did not set out to look for, but simply always seem to find us… if we let them find us. What I loved about this young lady was that see was living her life and making music all the while and most likely unbeknownst to her, making music out of her surroundings as well… no matter who was around her or what they even thought. Perhaps in this, there are conductors all around us waiting to raise up a song in each of us. Or, maybe we are the conductor? Sadly, what keeps us from being the conductor is the thought that even though we know what the right thing is to do, we rarely do it for fear of what others will think. Ironically, it is the others who need not think, but simply play their song. When music is played from a deep place, it transcends that which is only audible to the ear to a movement undefined but right that can be heard only from a place deep within the soul. There is a concerto waiting to be played. Are you ready to play it? In this, I would venture to say that not only does the world need to hear your song… you need to hear your song. Music moves. Pass it on. Yesterday 26 Dec,20011. My daughter Meg and I went to see Tino.Gunnar joined us. I was pleased to see the love my daughter Meg showed to Tino. Tino is in hospice care at this time. He looks much like the old Tino, but his memory is slipping. He cannot eat and consumes little liquid. If he were to drink a hole pop he would throw it up.He still has a twinkle in his eye.I wonder if he really knows he is there to die. He wanted to put his shoes on so he could go home. His medicine is by injection as he cannot swollow pills.This little man has a good heart and I belive that his purpose may be to teach those of us how to care about the less fortunate and under privileged. I was very pleased to meet Gunnar. There are many who talk the talk, but don’t walk the walk. Tino could have just been a passing moment in Gunnars life. The fact that he took the time to come see Tino place him high on my list. thanks you Gunner for walking the walk!!! Today is a good day!!! Constantino Busto Cruz has left this world for a better place.After all the physical abuse, alcoholism and the HIV he was carrying.He now will suffer no more. God took him home about 10AM. Meg visited him yesterday and thought he was doing pretty well. He was sleeping more.Was able to get up. Meg went to pay her final respects to him. He has died with no family around him. He has 2 daughters in Mexico. God Bless Tino. Gunnar: Thank you for going out to be with Tino and Meg. I offered, but she was in a hurry to get there. You will never know how much I appreciate that you went. You are a special person. I will not ever forget you and what you have done for Tino in recognizing him as a person. Thank you for being able to see the good in the least of these. The Bible says that the least shall be the greatest and the greatest the least tino may not have been able to tell what an effect he would have on our lives,but I am still on a journey to be able to recognize everyone has a purpose.